I’ve been bingeing on books about music lately, partly because there have been so many big, critically acclaimed releases by musicians in the past year or two, and otherwise fueled by my ongoing email correspondence with my dog walker/local musician on the topic of music books—a correspondence that initially took shape as comments scribbled back and forth on the notes he leaves after every walk. (My life is adorable.) Below are some of my favorite recent reads on the topic. The nice thing about visiting home is that you have an excuse to do a bunch of touristy things you haven’t done in ages, and rarely got around to when you lived there. Case in point: Belle Isle. I haven’t been out to the park since a friend’s wedding years ago. 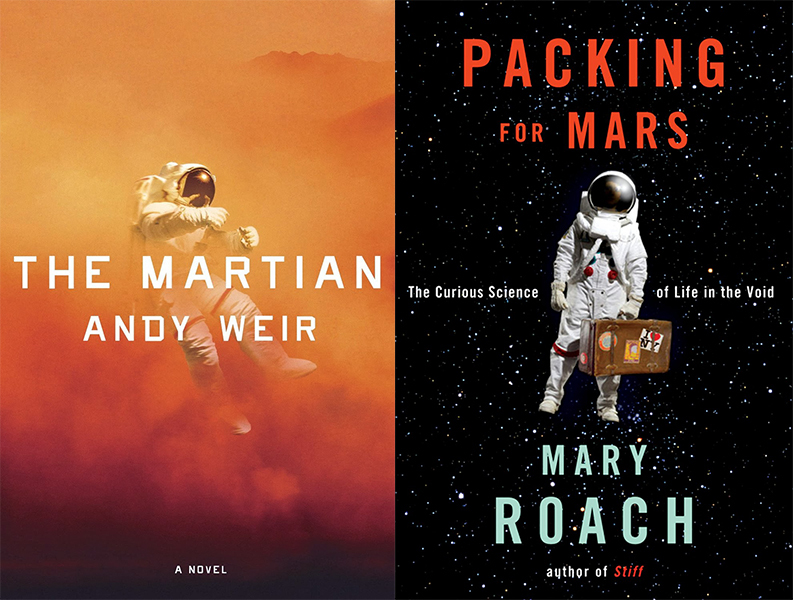 The Martian had been on my reading list for a while and when the trailer for the movie came out I knew I was running out of time to read it, because there was no chance I was not going to see the movie on the big screen, and I knew this was the kind of book I wouldn’t read afterward. I don’t have the patience to spend hours on a book that’s mostly plot-driven when I already know the plot and it’s outcome, so it’s rare for me to read a thriller or sci-fi novel after seeing the movie. 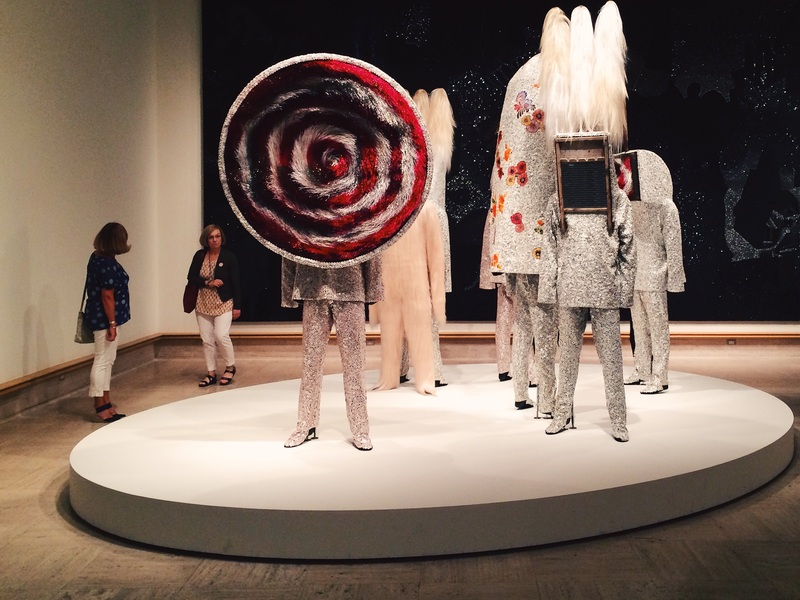 I finally made it to this show at the Park Avenue Armory on the very last day. I had been excited to see it for a while. since I’d read so many rave reviews, but I also like to nap on the weekends, so, you know. The films were wonderful, the light sculptures great, the music atmospheric and the live child actors creepy, but I did wish the overall effect was more immersive. To say that apocalyptic literature is a trend is a little misleading, unless your idea of a trend is rather long term. Impending apocalypse has been a source of special interest for literary writers since the birth of postmodernism, and it certainly wasn’t a new idea even then. 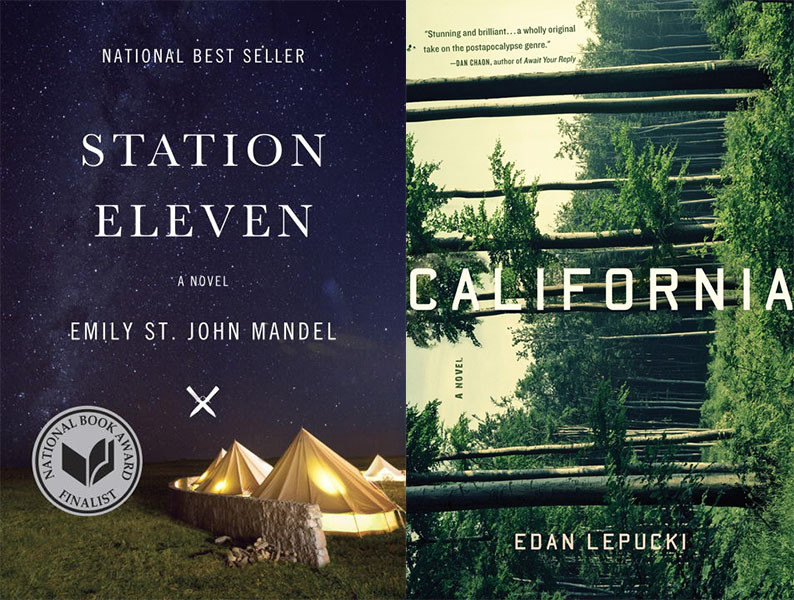 That being said, I have seemed to gravitate toward apocalyptic novels in the past year or so, like The Age of Miracles, Super Sad True Love Story, Station Eleven and California. But the two which seemed to me both most similar and most disparate from each other were the latter two, which I read pretty much back to back. There’s something about bleak, winter beaches that fascinates me, and that goes double for beaches with amusement parks and boardwalk attractions that close up for the winter, making the whole place feel like a ghost town. 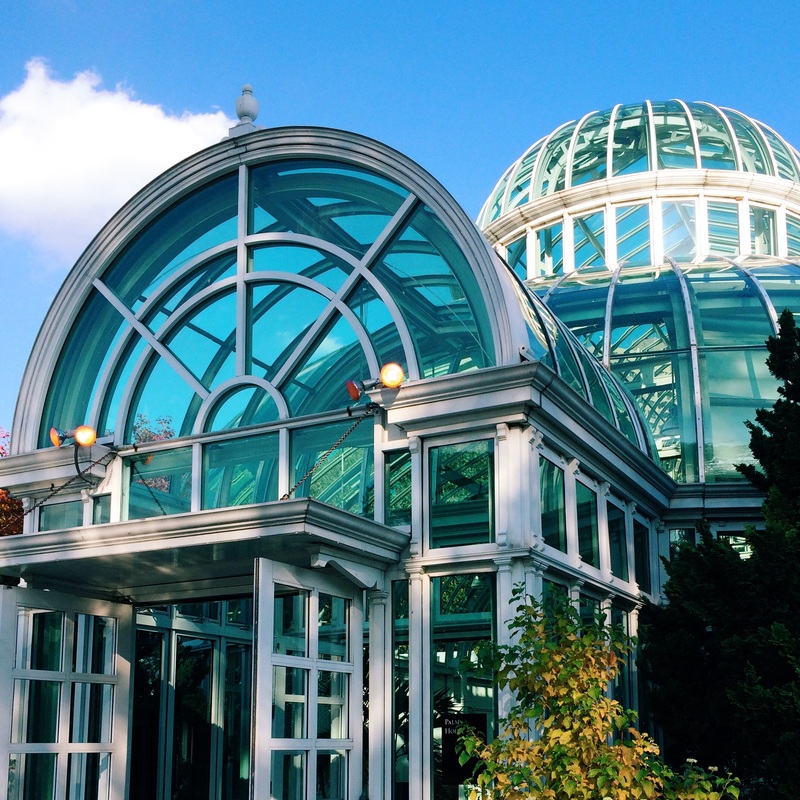 My love of a good botanical garden is well-documented, so I was eager to visit the Brooklyn Botanical Gardens soon after moving to New York. Dlectricity is one of my favorite Detroit events—a biannual festival of illuminated art that takes over Midtown for two nights in September. I was happy to make it this year, but since I had to squeeze it in between packing for a move and farewell drinks with friends, my trip was a bit rushed. I didn’t make it to half of the exhibits, but I still got to see some gems. The saga of street photographer Vivian Maier and her posthumously discovered photographs culminated this summer in the release of Finding Vivian Maier, a documentary piecing together whatever could be discovered about her life and work from interviews with the people who (hardly) knew her. It’s a difficult business to extrapolate the artistic process of someone so fiercely private as Maier from such limited sources—many of the interviewees are middle-aged adults who only knew Maier as their childhood nanny. But the resulting film is a fascinating character study that fully acknowledges its limitations and is, perhaps, better for them. But if John Maloof could have had the opportunity to meet Maier before she died, he might have produced something similar to Bill Cunningham New York, a charming 2010 documentary by Richard Press that follows the legendary fashion photographer around the city as he goes about his daily work. Some of his favorite subjects—including my spirit animal Iris Apfel—chime in along the way, but the film’s greatest strength is Cunningham himself, who is eloquent in speaking about his life and process, and clearly one of the kindest people you could ever imagine running into on the sidewalk with a camera in hand. Cunningham and Maier were contemporaries—both born in the 1920’s to humble, working class families—though Maier died in 2009 and Cunningham is still living and working in NewYork City, hitting the streets every day to shoot for his New York Times columns. The greatest difference between these two careers, of course, is that Cunningham has enjoyed artistic success during his lifetime, while Maier’s fame comes posthumously. But Cunningham is also hesitant to call himself a photographer. His greatest talent is his eye for fashion, and he says himself that he doesn’t consciously practice the craft of photography—he simply tries to document what he sees. Maier, on the other hand, had an exceptional eye for composition, and her work takes full advantage of street photography’s potential as an art form. What these two photographers do have in common are their ascetic lifestyles and monk-like devotion to their art. Maier worked as a nanny for 40 years, occupying cramped rooms in her employers’ homes where she hoarded newspapers and rolls of film. Cunningham has spent most of his life living in a tiny artist studio in Carnegie Hall that’s filled with file cabinets. There was no kitchen in his studio; the bathroom was in the hall. Even after the remaining artist-tenants at Carnegie are relocated, he has the kitchen in his new apartment gutted to make room for his files. Neither of them was ever in a romantic relationship, and while they both came from pleasant enough families, neither remained particularly close with them. They both spent most of their lives on city streets—Chicago and New York. It’s pretty clear that Maier’s decision to become a nanny was a pragmatic one, not motivated by a special fondness of children or a desire to be a part of a family. And she spent a period of several months traveling the world alone and recording her journey. For two people who found their inspiration in strangers on the street, home life seems to have held little appeal. Cunningham speaks of intentionally distancing himself from his work by not “wining and dining” at the society parties he’s photographing, and not taking part in the fashion culture he documents—he wears the same practical uniform day in and day out. Maier’s subjects are regular people, many of whom she catches, unaware, in the ordinary acts of life. Perhaps the extreme privacy for which Maier is now known, and which defies the efforts of even the most dedicated biographer, was her own way of distancing herself from her subject: ordinary people. 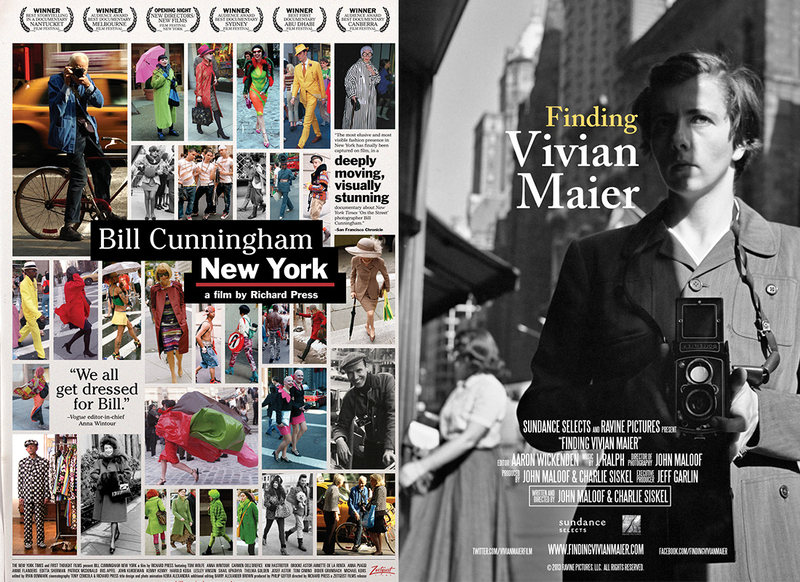 Last time I looked, Finding Vivian Maier was still available On Demand, and Bill Cunningham New York is streaming on Netflix. Check them out.